If you’ve had your fill of Christmas fare and can’t face leftovers of ham or turkey then this is a delicious punchy dish to try that is as far removed from festive-season food as possible. Thai cuisine has some amazing grilled meat, poultry and seafood dishes. Simple marinades bringing out all the sweetness of the meat and the accompanying spicy chilli dipping sauce making every bite explode with flavour. 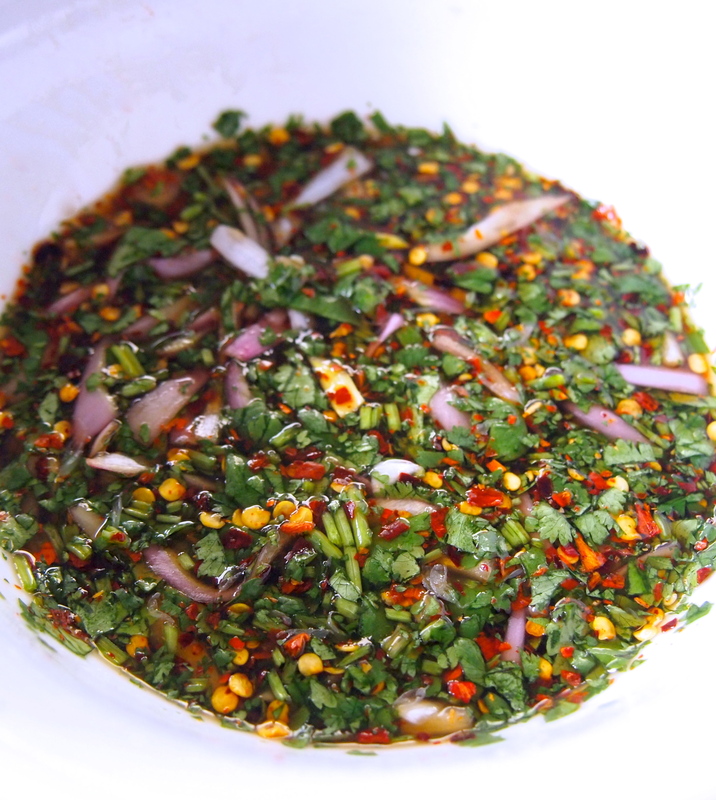 Jaew is a northeastern Thai dipping sauce that is made using dried chilli flakes rather than fresh chilli giving it a wonderful smoky aroma which is very addictive, I could slather it on anything! Pork, and pork neck in particular, is a great cut for this type of grilling as it remains moist and tender, don’t be tempted to try tenderloin or fillet as it would dry out too much. 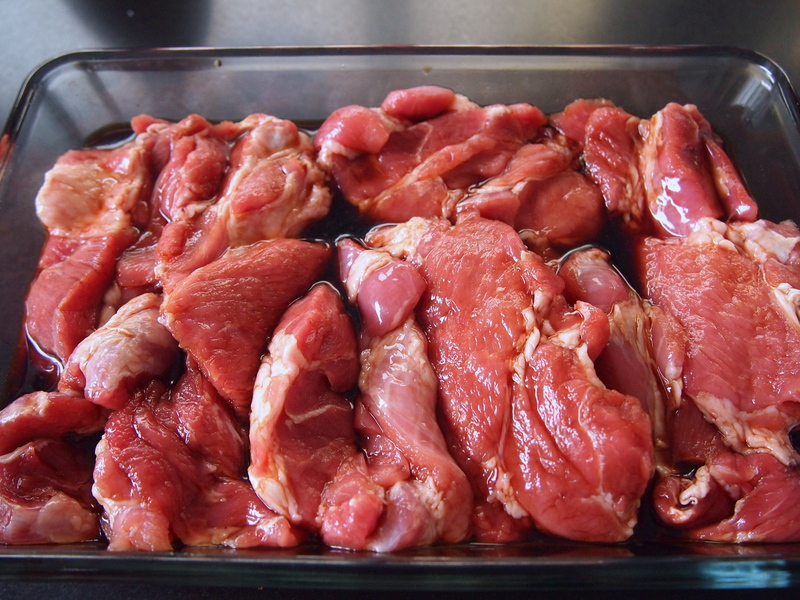 I like to buy a whole pork neck and cut it into thick slices to marinade. After it’s been grilled I cut it up into more manageable size pieces, ensuring even more moistness. This is great served with rice (coconut rice in particular is very good) and sliced cucumbers. Place all the marinade ingredients in a large bowl and whisk well to combine, making sure that the sugar gets dissolved. Add the pork slices and mix to coat. Cover and refrigerate for 2 – 6 hours. To make the jaew, mix everything together in a bowl. Adjust the taste with more fish sauce, lime juice, or sugar, if necessary. The sauce should be predominantly sour and salty. 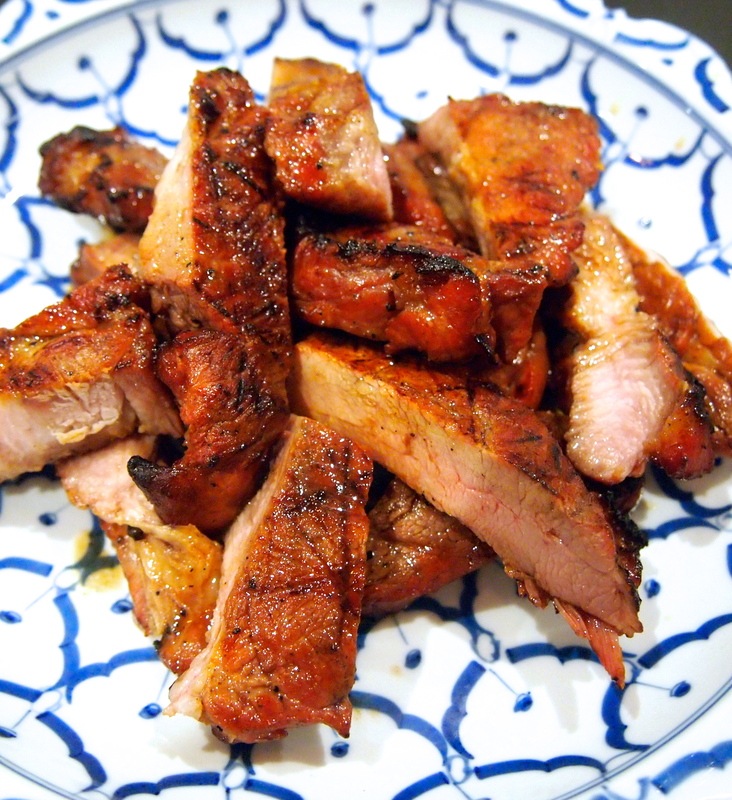 To cook the pork, Remove the pork from marinade and lightly pat dry with paper towels. 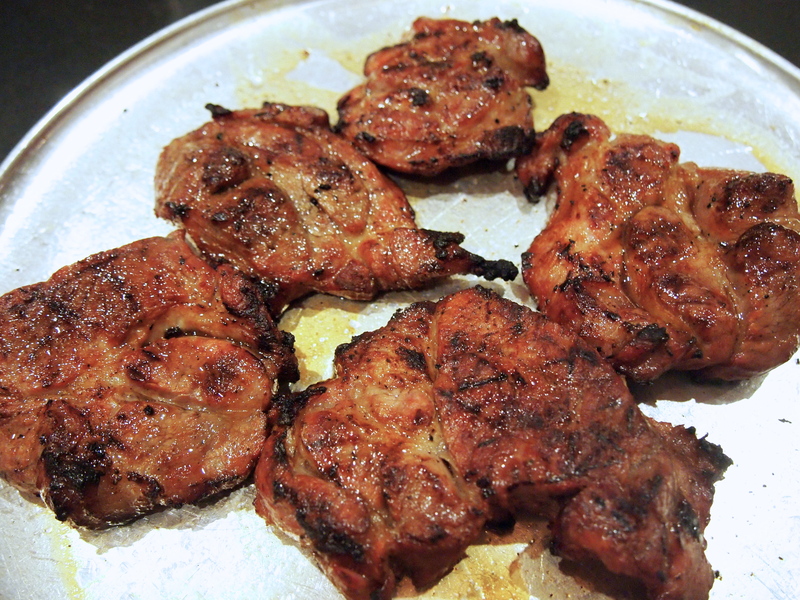 Grill the pieces of pork over a medium heated grill/barbecue, until meat is tender and the surface is charred, about 30 minutes, turning the pieces regularly and basting with a little of the marinade. You could also cook this on ridged grill pan indoors. 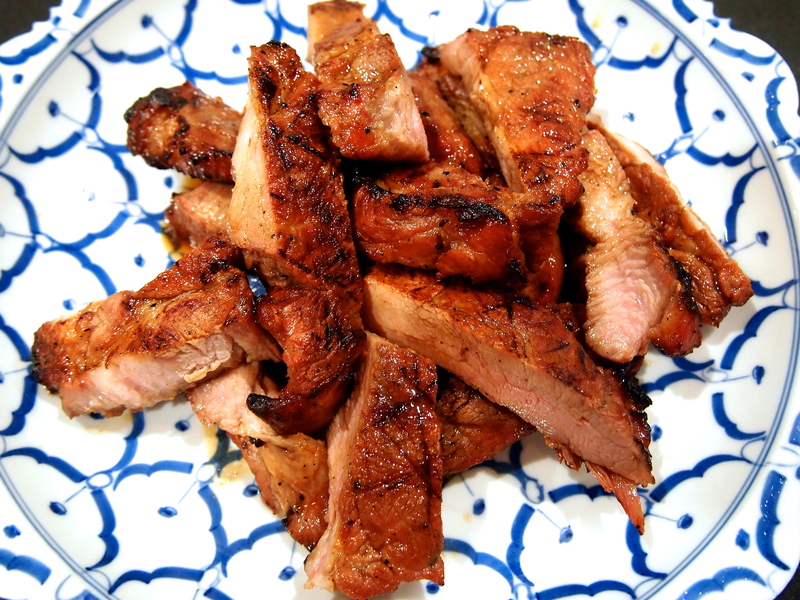 Let rest for 10 minutes, then slice and serve with the jaew on the side.